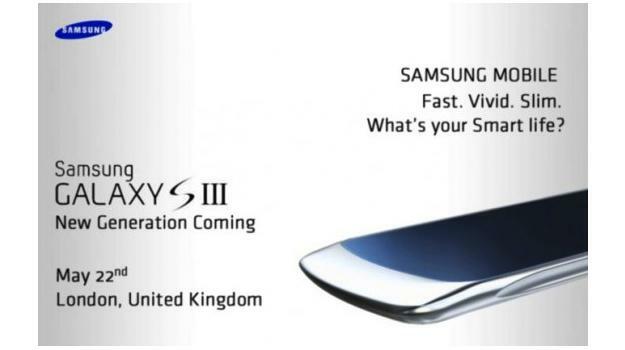 Could the latest leaked Galaxy S III event invite be the real thing? Next to the “new” iPhone, Samsung’s Galaxy S III is easily the most anticipated phone release of 2012, and following early disappointment that the device wouldn’t be released during Mobile World Congress in February, we were told its own, dedicated launch event would take place during the first half of the year. After debunking a rumored April release date, Samsung said it would let the world know when the S III was coming via Twitter. We said at the time the world couldn’t wait, and sure enough, an intriguing image has arisen which could pre-empt Samsung’s big reveal. The image shows an event invitation with the tagline “Samsung Mobile. Fast, vivid, slim. What’s your Smart life,” along with a half-image of a mysterious phone and the words “Samsung Galaxy S III” and “New Generation Coming.” The date is 22 May and the location is London, United Kingdom. The 22 May is a Tuesday, and the date featured on a previously leaked image of the phone, along with London as the location for the S III’s launch, so there’s nothing out of the ordinary there. Samsung already uses a variation on the words “fast, vivid, slim” to promote the Galaxy S II, except it calls it “vivid, fast, slim” on its global S II webpage. Would it use the same line, just in a different order, to advertise the new model? However, it’s the picture of the phone that’s least convincing. Gizmodo.co.uk says it’s a considerable departure from established phone design, and totally different to Samsung’s existing range of phones. Do we expect Samsung, a company whose phones all look very similar to each other, to break with tradition this radically? Phandroid.com spotted a tweet from mobile industry insider Eldar Murtazin, who said he had “no comments” on the authenticity of the S III picture. However, the addition of a smiley face after this does indicate he believes it’s the real thing. Perhaps. An end of May event held in London is believable, and has been heard before, but the use of the S II’s marketing blurb and the space-age phone design does see the invite veer off into the realm of fantasy. There’s a chance Samsung may speak up if the whole thing is a fabrication, as it has done so before; however if it remains silent, can we take that to mean that the date is correct and that what we’re seeing really is the Galaxy S III?